China's launch of the first quantum satellite Tuesday will push forward efforts to develop the ability to send communications that can't be penetrated by hackers, experts said. 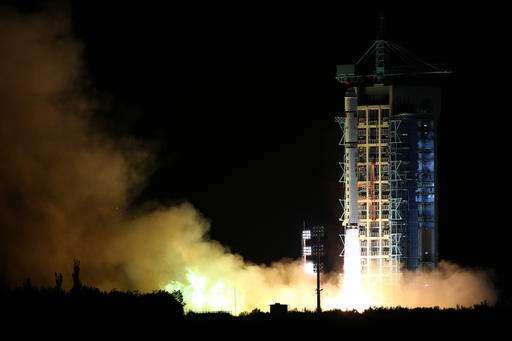 The satellite launched into space from the Jiuquan launch base in northwestern China's Gobi desert will allow Chinese researchers to transmit test messages between Beijing and northwestern China as well as other locations around the world. If the tests are successful, China will take a major step toward building a worldwide network that can send messages that can't be wiretapped or cracked through conventional methods. "It moves the challenge for an eavesdropper to a different domain," said Alexander Ling, principal investigator at the Centre for Quantum Technologies in Singapore. "Lots of people around the world think having secure communications at a quantum level is important. The Europeans, the Americans had the lead, but now the Chinese are showing the way forward." Cybersecurity has been a major focus in recent years for China, which has pushed regulations aimed at limiting technology imported from the U.S. in the wake of Edward Snowden's revelations of widespread surveillance by the U.S. through the use of American hardware. The biggest challenge, Ling said, is being able to orient the satellite with pinpoint accuracy to a location on Earth where it can send and receive data without being affected by any disturbances in Earth's atmosphere. The results of China's tests will be closely watched by other research teams, he said. "It's very difficult to point the satellite accurately," Ling said. "You're trying to send a beam of light from a satellite that's 500 kilometers (310 miles) above you." "The theory is already there, the technology is almost there," he said. "It's just a matter of time." Pan Jianwei, chief scientist on the satellite project, was quoted by the official Xinhua News Agency as saying the launch proved China was no longer a follower in information technology, but "one of the leaders guiding future IT achievements." Truly astonishing what someone will spend money on when quantum fairy dust has been sprinkled on top.